This is a neat little book. It does a good job simultaneously existing as a children's book and a mock-children's book, which isn't an easy feat. We wound up getting this as a Christmas present from my parents, which was a good guess on their part: we'd been wanting to track it down for a while. The story is about a Hanukkah latke who's made, then winds up running around in pain and frustration, in part because of the boiling oil he was initially cooked in, but also because he can't find a place where he belongs in a world built around Christmas. The humor is sharp and dark, but not quite as dark as you might expect. Like Roald Dahl, Snicket has a good sense of what kids find funny and adults find horrific, and he exploits that line proficiently. Depending on the reader's tone of voice, this could easily be read as a silly storybook to a young kid or dark satire to an older crowd. 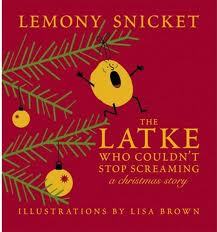 The story works metaphorically for the sense of alienation felt by Jewish kids during the Christmas season. It's a tricky subject to tackle, but Snicket does an admirable job here. Lisa Brown's minimalist art works well with the story, and the overall design gives the impression you're reading something unmistakably Christmas-themed (which is kind of the point). My one complaint is that it does feel a little padded. There are several pages featuring identical pictures of the Latke screaming with identical text of the same scream on the opposite page. While this works as a running gag, it seems just as likely it was done to increase the page count to a point where it could be published in hardback. Nevertheless, this is a great little piece. If you're looking for a cheap Christmas gift for a Jewish kid - or adult - with a sense of humor, you couldn't do much better than this.